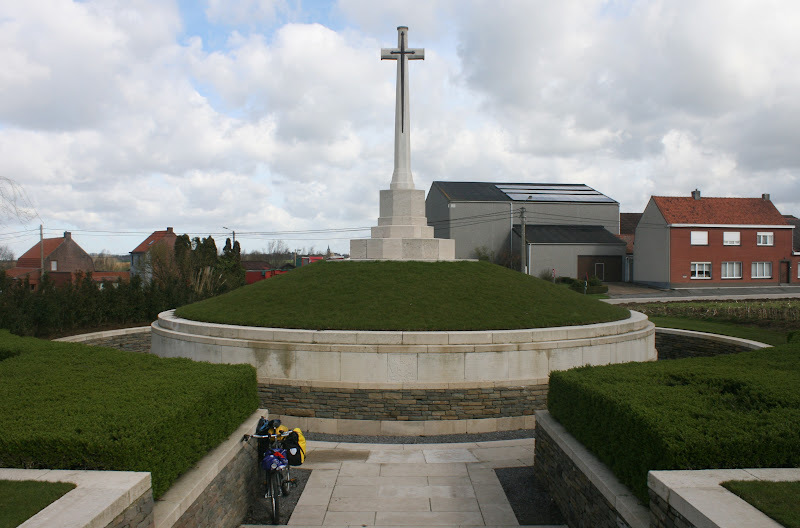 On Monday 30 March, I left Ypres and passed into country #4: France. I went via Wijtschate. Outside Wijtschate is the Peckham Farm Crater, which is one of the massive craters left after Allied mines were exploded under German trenches, to start the Battle of Messines in 1917. 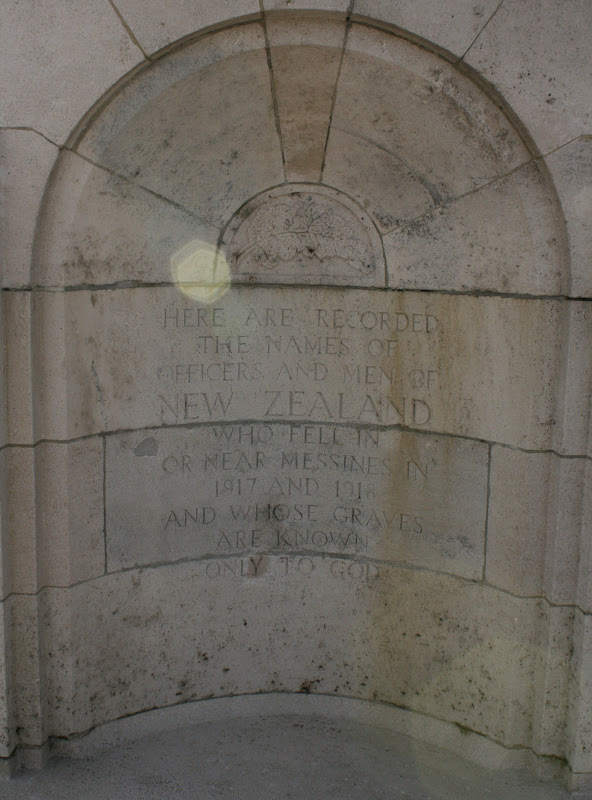 New Zealand troops played a significant role in the battle and there is an NZ memorial in Messines, including the graves of some members of the NZ Cyclist Battalion. I entered France at Warneton, where there is a memorial to Maori soldier Charles Sciascia, who survived Gallipoli, only to die in Flanders. I followed a cycle path along the river into Lille, passing the citadel and the zoo in the centre. Lille covers a large area, and as I was nervous cycling through a city, it took a long time to cross. A couple of camping grounds that I had hoped to stay at were closed, but I found one that would have me close to Faumont. The gale force winds returned that evening. They were pretty scary. I had pitched my tent behind some trees that looked like macrocarpa, and I worried they would collapse on the tent. My tent thrashed around all night, making it very difficult to sleep. When I got up in the morning, the roof on one of the nearby cabins had been completely peeled back by the wind. The wind killed people in Benelux. I tried to follow a route through a forest suggested by Google Maps' cycling function. Not for the last time, it got it completely wrong and sent me down a path that came to a dead end. It rained again. My clothes needed a wash and my electronics needed charging, so I booked a room at the Hotel Baudouin in Valenciennes. It was excellent. They let me store my bicycle in the garage and there was a buffet breakfast where I could load up on energy for the day ahead. 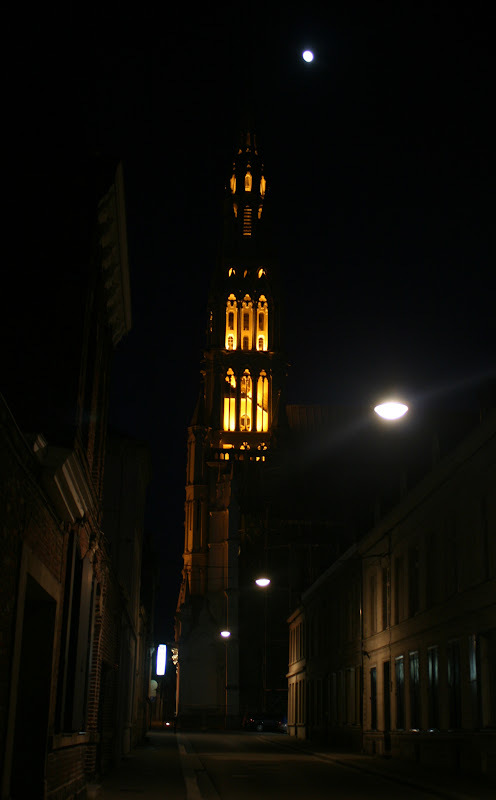 I left Valenciennes on the 1st of April. I would've hope that the weather was improving by then, but the next few days were truly miserable and the low point of the trip. I think I enjoyed the Ardennes less than anyone ever - and yes, I have seen "Band of Brothers". In Fourmies, I stayed at the municipal camping ground. It rained a lot the following day so I remained there. I found an outdoor power outlet where I could charge my tablet. I left on the Friday, but the rain continued and the temperature was a high of 6C. I was on a busy road with a lot of trucks, I was frozen, and I couldn't decide whether to go on or try to stop. I changed my mind several times - I assume I was hypothermic. I eventually found a camping ground, but my clothes didn't dry over night and the following day was even colder (5C). I cycled 2km into Rocroi and took a room at a very nice hotel. I've learned from this trip that while the low points of cycle touring can be truly miserable, one's mood can also be turned around quite easily with a good bed and some nice food. I visited an art exhibition where the local artist had a painting of Fiordland.